A favorite one-pot meal, this “comfort food” is especially good during the rainy season. To make your arroz caldo look and taste better, try topping it with some safflower, toasted garlic, and scallions — squeeze half a lemon and you are done. 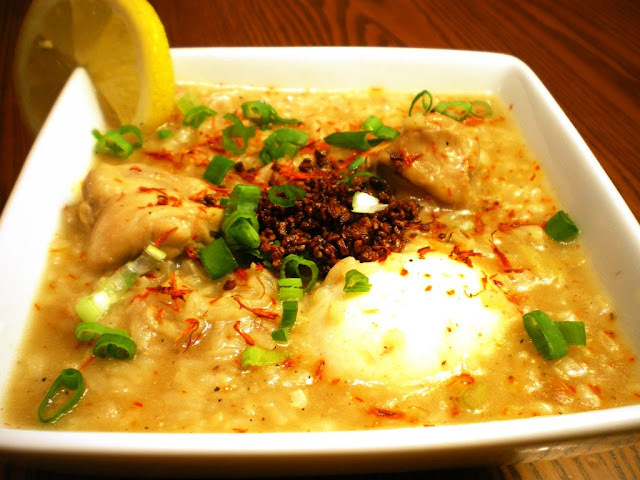 Arroz Caldo is usually served during breakfast because it is filling. It can give you the energy that you will need until lunch time. 1 Heat 2 tablespoons of the oil in a pot and stir-fry half of the garlic until golden brown. Add the onion and ginger and stir-fry until the onion is translucent. 2 Add the rice and stir-fry for 5 minutes until lightly browned. Add the water and cover the pot. Increase the heat and bring the mixture to a boil, stirring occasionally. 3 Then reduce the heat, add the chicken and simmer for another 30 minutes or until the rice and chicken are cooked. 4 While the rice is cooking, heat the remaining oil in a skillet and stir-fry the rest of the garlic until crisp and golden brown. Drain on paper towels and, set aside. 5 When the rice and chicken are cooked, add the fish sauce or salt, stir and continue to simmer over low heat for another 2 minutes. 6 Serve in individual soup bowls seasoned with black or white pepper. Garnish with the spring onion, fried garlic and saffron, and serve with lime halves on the side. Note: This soup tastes even better when prepared a day in advance and kept overnight in the refrigerator, then reheated.